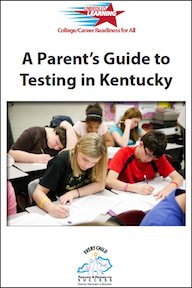 In 2009, Kentucky became the first state to adopt the Common Core State Standards in English/language arts and mathematics. These new standards, known as the Kentucky Core Academic Standards are more rigorous and aligned with college coursework and the 21st century skills required in the workplace. Two years later, Kentucky became THE leader of our nation as the first state to test students on the new, more rigorous standards and base school and district performance on whether students are on target to graduate from high school ready for college and/or career. Kentucky Education Commissioner Terry Holliday explains the Unbridled Learning accountability model in a videotaped presentation. Click here to view the presentation. 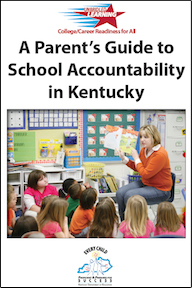 As many of you know, the state’s adoption of the Common Core State Standards and new Kentucky Performance Rating for Educational Progress (KPREP) assessments tied to those standards have raised the bar for student performance in Kentucky. However, we expect that in the short term this will lead to proficiency rates among students that are lower than what we have seen previously on the Kentucky Core Content Tests (KCCT), perhaps anywhere from a 10-to-40 point drop. It is important to remember and share with parents, students and community members of a few important points. These results cannot be compared to previous results, since we are assessing students on a different standard. The previous standard was basic proficiency on math and reading. The new standard is college and career readiness. We made the change to college and career readiness due to the competitive global economy that was the basis of 2009 Senate Bill 1, which required KDE and the Kentucky Board of Education to provide new standards and assessments that are internationally benchmarked. The results of the Kentucky assessments are more closely aligned to results from the National Assessment of Educational Progress (NAEP). Those results report proficiency at a much higher level than most state tests. Being proficient on NAEP is similar to our new college and career ready proficiency. Our intent in raising the bar is to help more students be better prepared for college and the 21st century workplace. We should not dwell on trying to compare previous years’ data with the new results. We should focus on what we need to do to help more students be competitive, which means Kentucky will be more competitive.